OSF was going to the park for their nightly “GA” (General Assembly) … you know, something guaranteed by that pesky First Amendment … and SFPD appeared to want none of it. So they surrounded the core of the OSF group with their “kettle” – the first step before arrests begin en masse. But then they grabbed a guy from outside the cordoned area – someone not in the cross-hairs of an arrest – someone sitting down, no less – no threat. The PD put him in one of their choke holds – and that was it for the protester. Literally. He started twitching and convulsing and moaning. This man lay there, in cuffs, at the feet of the police for half an hour before the PD would allow the Occupy medics to even look at him. It took close to an hour, and calls from Occupy protesters, before the SF Fire Department paramedics arrived on the scene. The protesters had to call “911” to get the ambulance – not SFPD. The paramedics took the guy out on a stretcher, strapped down to one of those boards they use when they’re worried about spinal injury. Now, remember, this guy was not in the cordoned off area. He was sitting on the ground holding a sign, a total non-threat. And the police not only grabbed him and pulled him from the “safe zone” but hurt him bad enough that the paramedics had to imobilize him for transport. Again, remember, these are non-violent protesters. No weapons. Most have zero criminal records. At least a quarter to a third of the crowd are women. And the police are in full riot gear. The police have no justification for striking unarmed, peaceful civilians simply for non-compliance – especially when it involves them exercising their first amendment rights, and especially when they are not a threat to anyone, least of all the officers. Once the injured man was taken away in an ambulance, Occupiers started telling their stories from the night before. Most actually said that a lot of the officers they encountered after their arrest were cool – professional, polite, humane. But this wasn’t always the case. Many of those arrested the night before were pulled out of the “safe zone” on the sidewalks into the “to be arrested zone.” When some arrestees got to the station for processing a number had to have their cuffs removed ASAP by the receiving officers because their hands were purple and swollen. What happened to “serve and protect” here? These are peaceful folks busted for demonstrating. There is no need for such tactics. On top of which, how moronic are these officers anyway? Haven’t they caught on yet that everything they do is being photographed, streamed, and recorded? And that the people they are arresting aren’t criminals, or even used to being victims of the police? These are taxpayers – who expect and demand their police force to be professional, at the very least. By around 7:30 things were at a fever pitch. There was an inner circle of Occupiers awaiting arrest. Around them was a cordon of SFPD. And around them was at least 500 people – loud, angry people. 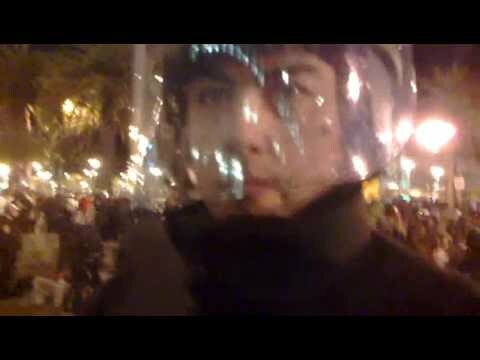 Someone at SFPD must have seen where things could get out of hand and offered Occupy a deal. They could stay and face arrest, or be allowed to leave. And then, an amazing thing happened. Occupy decided they wanted to stay and finish their GA with the police cordon right in it’s midst. They didn’t say they’d camp out or anything like that, they simply said they wished to be permitted to finish their peaceful assembly – to exercise their right to free speech. And SFPD caved. I shouldn’t say “caved” because it was actually the first smart and human thing I’ve seen SFPD do in the last 24 hours. The commander on the scene announced that everyone would be released but if they stayed in the park they could be subject to arrest. And then the police left the scene (but stayed in the area, of course). And Occupy had it’s GA, and then people dispersed for the night – peacefully. This was the first time I’ve seen the police actually back down from Occupy. For once, The People outnumbered The Man and they had no choice but to depart. And, again, don’t get me wrong, not all police are the enemy. You can look at some of their faces and it’s clear that a lot of those officers don’t want to be there and don’t like what they’re doing. But what choice do they have? So not only is the right of free speech and peaceful protest protected by the US Constitution, but in California you can sue anyone – even if “acting under color of the law” – who violates those rights. And the civil penalty is applied against each person involved in the act of suppression – the case would be made against each officer who violated someone’s constitutional rights. Officers who behave professionally would not be hurt – the department as a whole would not be hurt – just the officers who don’t belong on the force. What was so interesting last night, was that it was right after one of the Occupy protesters recited this code to the officers and the public that the SFPD started to back down. Maybe it’s a coincidence. Maybe the SFPD had forgotten this code. Maybe they hoped no one would look it up. But 52.1 is freakin’ awesome.